Our guest blogger this week on the Toby Creative Perth Marketing Blog is the lovely Pille Repnau a local Perth photographer from Perth Personality Photographer. 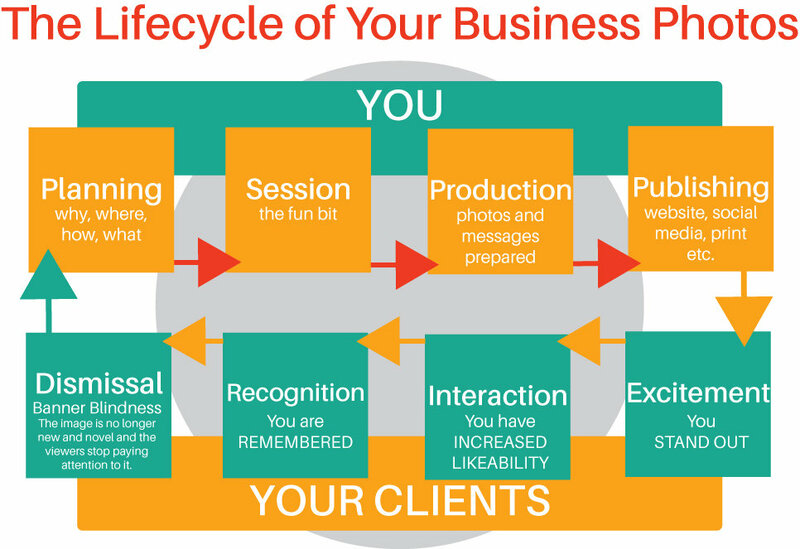 Pille shares in this article her insight into understanding the lifecycle of your business photos, and the benefits in refreshing your photography regularly for your website, social media and profile images. Is the old age of your business photos letting you down? Photographers will often as you about the age of your images and recommend that you need to update it for your business. But why is that? Because we grow older and change, or is there something else with it? How does a business photograph “die”? Dismissal – The image is no longer new and novel and the viewers stop paying attention to it. Let’s start with the end and discuss how the life-cycle of an image end. We don’t often think about the life-cycle of our photos and when we do it is when we get a new position or have changed our haircut. But there is one, even more crucial element to it – it is called banner blindness or oversaturating the viewers with the same image. Simply put – they won’t pay any attention to your ad, campaign, post or marketing efforts because the photo on it looks like they’ve already seen it. Most cases it is subconscious way of our minds working in this world with information overload. A way to disrupt this blindness and capture your audience’s attention and focus on you is to offer fresh, new, captivating images! You want to focus your customers on your products and to overcome this blindness you need to come up with not just fresh content, but also fresh imagery including photos. This will attract your client’s attention! Where are you using the images? Do you have a plan before you contact the photographer? If you don’t make sure you discuss it with them. A good branding, marketing photographer will have knowledge on how and where to use photos, which work best in different locations! – website; – social media; – print media etc? Make sure you discuss with your photographer where you will use the images and also find out about copyright (with Personality Photographer the copyright is yours no matter what you intend to do with the image!). This is simply the fun part. Don’t be afraid of it or put it off. A good photographer will dissipate all your fears and produce a wonderful relaxed environment. It doesn’t hurt to learn some basic poses and practice your best face in front of the mirror. Of course, have the photographer help you at the session with best poses and how to look like a superstar on an image. Based on your plan, the photographer will know how to prepare the images. What sizes and image ratios (the width and height of the image) are required. Do you plan to use photos for Facebook banner? These are wider and have different dimensions to photos on Instagram for example. This is a point that definitely needs also discussing before the session, so the photographer will know how to frame the image for best outcome. Talk to your designer and look at your branding guidelines. Ideally you should have branding guidelines for the photography you use as well. Are you placing your logo on the image? Or any other text? Again, a point that needs discussion in the planning phase but will be finalised here. Publishing – Website, social media, print etc. What did your plan say? Is it time to review it and see if you got some new ideas from the photographer? Go nuts and publish and share as much as you can to create hype around your images. If your session gave you multiple images, don’t publish them all at once – that will overwhelm the viewer. Share them over a bit of time and also keep an eye on the responses. if you get some comments other than “nice pic” then you and the photographer have done an awesome job and you stand out! You are getting likes and comments on your photos. Hopefully the photos are so good that you stand out and increase your likeability. Because the photos were planned with the end result in mind, you will start getting what you aimed for – more conversions, more contacts or requests, sign ups to your newsletter etc. Keep that in mind when you plan – what is the end result? What do you plan to achieve with these images? Because your campaign has been successful, your old and new clients now remember you and recognise you from your photos! You go to a networking event and you will get comments on your images. If you launched a campaign together with your images, they will also remember the campaign and have discussions about it with you. This is where you still sell, sell, sell! And sadly, we are back to the end again. You launch a new campaign with the same old photo but the result is not as exciting as it was the first time around. Go back to the start and repeat. Are you now interested in updating your tired, aging photographs on your website, or for social media? Would you like some further information on our range of photography and video services? Please phone (08) 9386 3444, email info@tobycreative.com.au or fill in our contact form to book a no obligation free initial consultation at your location so that we can discuss your specific marketing requirements. Great article from Pille. The need to keep content on websites, blogs and social media fresh and appealing is important. Images are content, and help to convey the tone of voice of a brand, their brand story, as well as providing a convenient attraction to the website visitor to allow them to quickly make a determination as to whether to invest any time in reading the written content associated to the image. Quality professional photography makes a huge difference.